‘Kennedy was involved in activities which went much further than the authorisation he was given.’ He checked the area for police activity and joined the team that planned to climb the power station structures. The judgement continues that this ‘appeared to show him as an enthusiastic supporter of the proposed occupation of the power station, and, arguably, an agent provocateur. Despite Kennedy’s long period of undercover deployment, the report shows no controls were in place, that the NPOIU had no idea what Kennedy was doing or where he was, nor any clear definition of what he was supposed to do. Scrutiny of most undercover officers’ work occurs when the evidence they have collected is presented at court, which provides an incentive for police to implement a rigorous system of control. This incentive did not exist for the NPOIU, the review concludes, because its remit was ‘to develop general intelligence to prevent disorder’. Compared with other undercover units, the NPOIU controls fell short. Not much of a surprise there, although undercovers working in serious organised crime have caused scandals too. It would have made more sense to check out the controls of other units that gather more general intelligence as well, such as certain sections of MI5. The HMIC claims that Kennedy ‘did help to uncover serious criminality’ but fails to produce any evidence, admitting that ‘the lack of specific outcomes makes an objective assessment of success very difficult’. Without evidence, it is impossible to decide whether the methods used were proportionate or not. Furthermore, HMIC states, in the Kennedy case the risks of intrusion were not systematically assessed and managed across the organisation. So either way, the intrusion into the lives of the people involved was not considered an issue during the many years of operation; and is still not an issue in this review. Ultimately, the flaws in the review mirror the shortcomings in the supervision of Kennedy. Either the HMIC did not do a good job, or – even worse – there was nothing to be found. In all those years, the review identifies only two moments where Kennedy crossed the line (‘by continuing to work following his arrest and by taking an activist with him abroad’). To conclude that Kennedy made only two mistakes is totally wrong however. These were the only mistakes that could be determined. The NPOIU had no idea what he was up to most – if not all – of the time. So it was impossible for HMIC to find out afterwards. Unfortunately the reviewers fail to make that point explicitly. One could claim that this review reconfirms the general excuse that Kennedy was a rogue agent who increasingly crossed the line. My conclusion is a different one: the issue is not failing to act within the rules; it is a failing of the rules altogether. The report’s contents are worrying enough but the consequences of what has not been addressed are even more serious. The report does not make clear what Kennedy’s remit was, or how he was evaluated. There is no concern about the length of his deployment, but for a remark that he tended to stay in the field for rather long stretches at a time – six weeks – without going back to his family. There is no mention of any assessment over the years, or decisions on continuing his undercover mission, or any view on how long was enough. No strategies for carefully phasing out an agent exist; the report just confirms that Kennedy was pulled out abruptly. Mark Kennedy was used in or visited 11 countries on more than 40 occasions, including 14 visits to Scotland. There is evidence that the NPOIU were securing arrangements with the destination countries for his overseas deployments; but they were not (on occasions) informing the authorising officer that he was going overseas, nor providing them with relevant information about what happened while he was overseas. That’s all. Nothing whatsoever on how this was organised, who sanctioned it or how it was evaluated. Those who officially authorised his actions were not told – revealing the superficiality of the authorisation process. They did not know when he was abroad, where he went or for what reason. If his supervisors did not know, then who did? Was it through secret police network cooperation at the European level? Was MI5 involved, or other secret services? Did he attend the G8 summit in Germany at the special request of the German authorities, as the press reported? 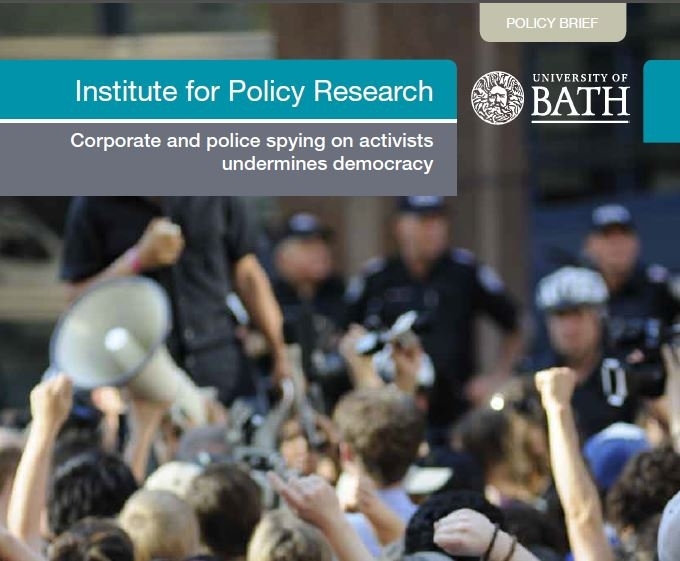 Essentially, in plain English, these units did the dirty work that nobody else was willing to take on, or that nobody knew or wanted to know about, with undercover officers confusing, or even ‘conflating’ policing protest with tackling ‘serious criminality associated with domestic extremism’. Something HMIC is not happy with. Publication of this review was cancelled at the very last moment last October, after the Guardian published evidence from two undercover officers who had had children with activists. Although the report recognises the psychological harm that may be caused to the police officers, no mention is made of the harm they cause to the women with whom they enter such a relationship, which is potentially far more serious. By refusing to acknowledge that Mark Kennedy was not the only one, HMIC failed to spot the pattern in the behaviour of undercovers sleeping with their targets. And such a pattern exists. In December last year, eight women took legal action against the Metropolitan Police, more specifically against five named undercover police officers. The women were deceived into having relationships with officers engaged in infiltrating environmental and social justice campaign groups between the mid-1980s and 2010. The five men had long-term intimate relationships with the women lasting from seven months to the longest spanning nine years. Some even had children. The five undercover officers are Mark Kennedy, Jim Boyling, Bob Lambert and two others who have not yet been exposed, known when undercover as John Barker and Mark Cassidy. The women assert that the actions of the undercover officers breached their rights as protected by the European Convention on Human Rights, including Article 3 (no one shall be subject to inhumane and degrading treatment) and Article 8 (respect for private and family life, including the right to form relationships without unjustified interference by the state). The women are also bringing claims for deceit, assault, misfeasance in public office and negligence. By doing so they seek to highlight and prevent the continuation of psychological, emotional and sexual abuse of campaigners and others by undercover police officers. This review is so riddled with failures, summing them all up seems a waste of time. The review is shocking for what is being addressed as much as in what has been omitted. Of the dozen or more reviews announced after the exposure of Mark Kennedy, this one confirms that any hope for introspection and real change is probably in vain.